I’m about to go on vacation for a couple of weeks and will take a break from blogging during that time. Here are few thoughts from the first few days of my vacation this year. Thanks for reading and enjoy the last weeks of summer! My husband and I just returned from a few days with some friends who spend a week each summer on an island off the coast of Maine, not far from Acadia National Park. The island is privately held and shared by a group of people, who divide up the summer so that only one family is on the island each week. The island has no electricity and the only running water is rainwater that is collected in cisterns (and used only for washing dishes). Drinking water must be collected from wells—with buckets. There are several buildings on the island—an old farmhouse at almost the highest point on the island, an elderly “cottage” next to the farmhouse, and a not nearly so old cabin that sits on the water’s edge, close to the dock and across from the lighthouse on Swans Island. Perhaps you’ve guessed by now: there are no bathrooms; only outhouses (several to choose from). It’s not all completely 19th century. There are gas-powered fridges in each of the buildings, along with a gas stove/oven. And, you can get at least some cell phone service—so long as your battery holds out. I look forward to this trip every summer. It’s great to see old friends, whom we don’t see much, if at all, during the rest of the year. It’s great to get away and to be so close to the ocean. But, it’s also great to be away—at least mostly away—from technology. Although I must admit that my smartphone (with back-up battery) makes the trip with me (mostly because one of our kids is at summer camp and the other was home alone this year), my computer stays home. Life slows way down during our visits to Harbor Island. A meal is a more complicated and communal affair, and clean up is even more intensive (there’s no gas-powered dishwasher), but it’s all so worth it. All of a sudden there’s time for games and a long, slow cocktail hour. There’s time for walks, and for sitting on rocks to watch the lobstermen doing their work. There’s time to read that book that’s been sitting on my bedside table and for writing in my journal. There’s time for helping with a little trail maintenance, or making sure there’s gas hooked up for the next visitors. There’s time to eat one’s lobster very slowly, a lobster perhaps caught that very day, delivered by the island’s caretaker. There’s also the telling of stories. What is it about candlelight that makes stories so much better? 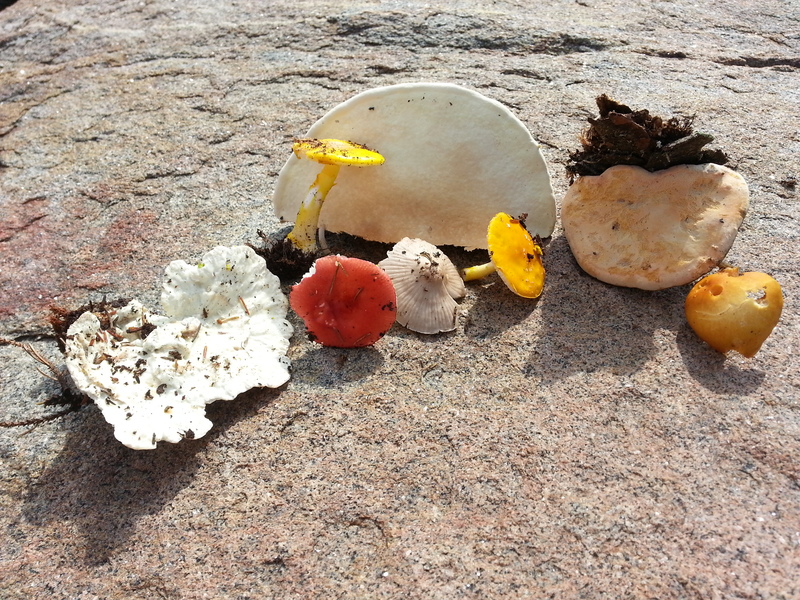 Unfortunately, we discovered that identifying mushrooms is a lot more complicated than we had thought. We didn’t feel like we could, with any certainty, identify any of them. Alas. My annual trip to the island reminds me of how important it is to slow down and pay attention to other things for a while. There’s a lot of this wondrous world, God’s amazing and mysterious creation, that we miss with our noses stuck in our laptops and our eyes fixed upon our smartphones. It seems not quite enough simply to try to slow down from time to time, but to make the effort to take that trip, even if it isn’t far, to a place where one is set apart from the normal routines of life. Rocks, mushrooms, trees, thistles, butterflies and birds are remarkable things and should be considered from time to time. And, good friends too.